More than 25 percent of Bryan Municipal Utilities’ power supply comes from renewable energy sources. 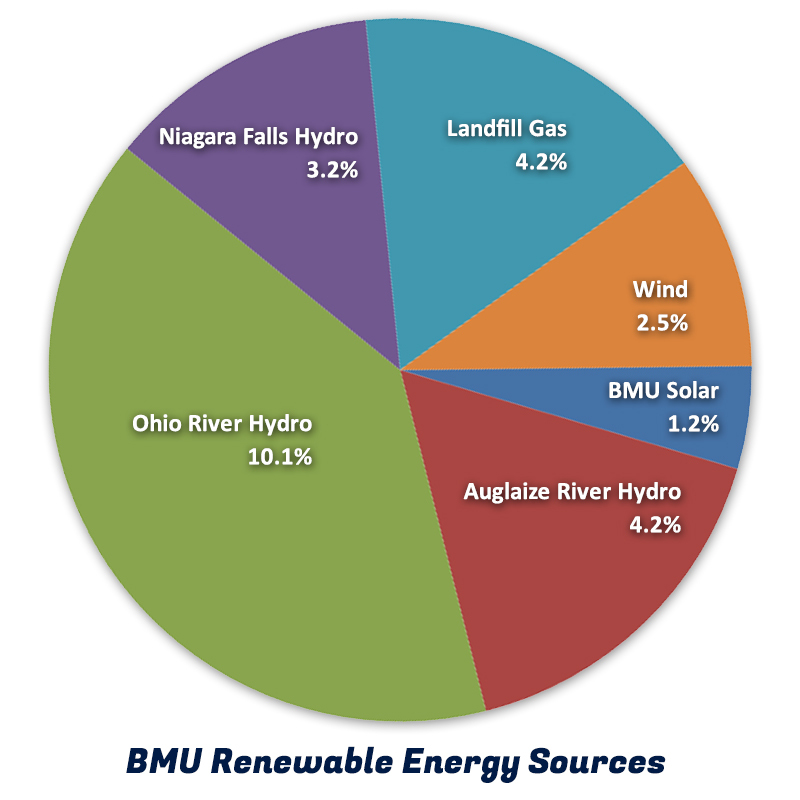 BMU owns a solar field and a hydro plant on the Auglaize River. The utility also co-owns hydroelectric plants on the Ohio River and purchases additional hydro, landfill gas, and wind power. Renewable energy is energy that comes from natural resources such as sunlight, wind, rain, and plants, and it is naturally replenished. Concerns about climate change, energy security, and energy prices are driving the switch to renewable energy. Bryan’s current clean energy sources prevent 41,221 tons of carbon dioxide, a greenhouse gas, from being emitted into the atmosphere annually. Not only is renewable power good for the environment, but it is also affordable. Bryan helps offset generation costs by receiving revenue through capacity contracts and selling renewable energy credits on the market. Nationwide, renewable energy capacity is growing. A growing number of states have set renewable portfolio standards specifying a percentage of all electricity generated must come from renewable energy sources such as wind, hydroelectric, solar, landfill gas, geothermal or biomass. In 2007, the Bryan Board of Public Affairs set a goal to derive 20 percent of the city’s power from renewable sources by 2015, and the utility was on target to meet that goal with new hydroelectric projects in construction. In 2012, the Board revised its goal to 25 percent renewable resources by 2020. The City of Bryan’s goal was reached when additional hydroelectric projects were completed on the Ohio River in 2016. In Ohio, the law for investor-owned utilities mandates that by 2025, at least 25 percent of all electricity sold in the state come from alternative energy resources. At least half of that, or 12.5 percent of electricity sold, must be generated by renewable sources. At least half of this renewable energy must be generated in-state. At this point, municipal and cooperative electric utilities are exempt from the standard, but BMU proceeded with its goal notwithstanding. Diversifying BMU’s power supply with clean, renewable sources is a good investment. It benefits our customers, the economy and the environment.